This started as a batik that my uncle made, which was inspired by a deck of playing cards. He wanted to do something a bit different with it so we matched the batik with an inner and outer border, then quilted it. It was quilted in the pattern "seaside" which is fairly simple as we didn't want to take away from the batik itself. It was a bit of a challenge to quilt due to the fact that there sometimes is a bit of wax residue left on the batik. This presented a bit of a challenge as the long arm machine seemed to drag as I quilted the batik area. Overall turned out really well and is unique quilt, one that you don't typically see. Great luck with House Hunting! this month. One morning I managed to get all the log cabin strips cut, then in the afternoon I managed to get them all sewn together. Wow, that was a really great day of sewing accomplishments. 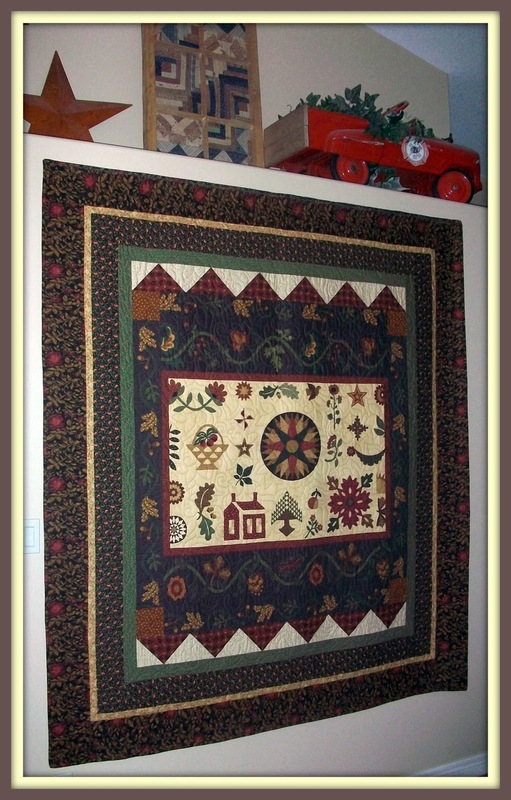 You need to make 2 log cabin blocks and 1 applique house per month for 12 month. Last month it took me forever and I was thinking that I would never be able to complete it all. I was cutting enough strips for just 2 log cabin blocks then sewing each of them, one at a time. This month I cut everything all at once then chain stitched each block. I can't believe how much faster that went. 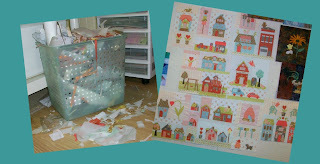 Now I just need to do one applique house each month, and that's quite do-able. I really love the fabric I picked and it should look stunning once it's all complete. The primary colors are fantastic together, so bright and cheery! 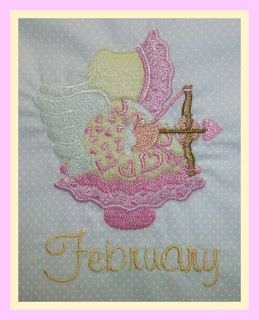 This is February's embroidery BOM that I finished to go with 30's fabric I picked up ages ago. No wonder it takes me so long to get this stuff done....when I programmed it into the machine it logged as taking 40 minutes to embroider and that's not even changing your threads every few minutes as the stitching progresses. You can leave the machine and walk away while it stitches, but I like to stay close by in case the thread breaks or the bobbin thread gets bunched. I've changed the color in each design to match my fabric which is yellow and white. This takes extra time as well as you are trying to envision the colors that come in the original design substituted with the new ones. I like it and I'm happy with it and once a month is not bad to keep up to date with the blocks either. She is cute! Marnie belongs to our Tiny Town BOM club which meets the 3rd Saturday of each month. 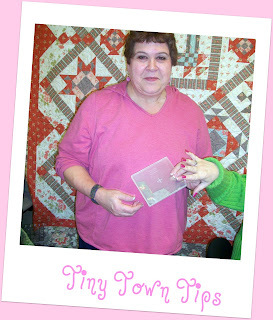 We all get together at Kindred Spirits Quilt Co. to work on our Tiny Town blocks. Marnie came up with a great idea to safe keep all those teeny itty bitty pieces that you wonder under, cut out and then loose in your quest to get the block finished. She cuts out all her small pieces and then places them safely in a plastic CD case. She was kind enough to bring everyone in the group one so that we all can keep our small pieces organized and safe. Thanks for the tip Marnie! 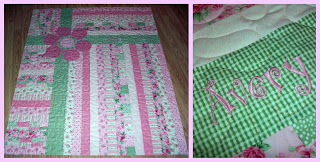 Linda's done it again...made the sweetest little quilt to be longarmed. This fabric was so cute and looks like it could be Old MacDonald's Farm. 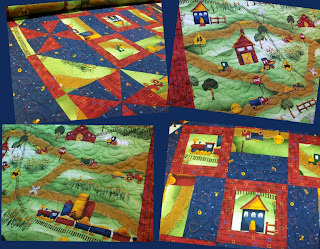 The backing was delightful and I couldn't stop looking at all the little tractors and trains, barns and landscapes. Can't wait til Linda has a grandchild to share this quilt with. When we were chatting about it, Linda mentioned that when she worked for John Deere, she collected all the little toy tractors and such that they offered. Those would be perfect to go with this quilt and both would be so much fun to play with. Another lovely project Linda. 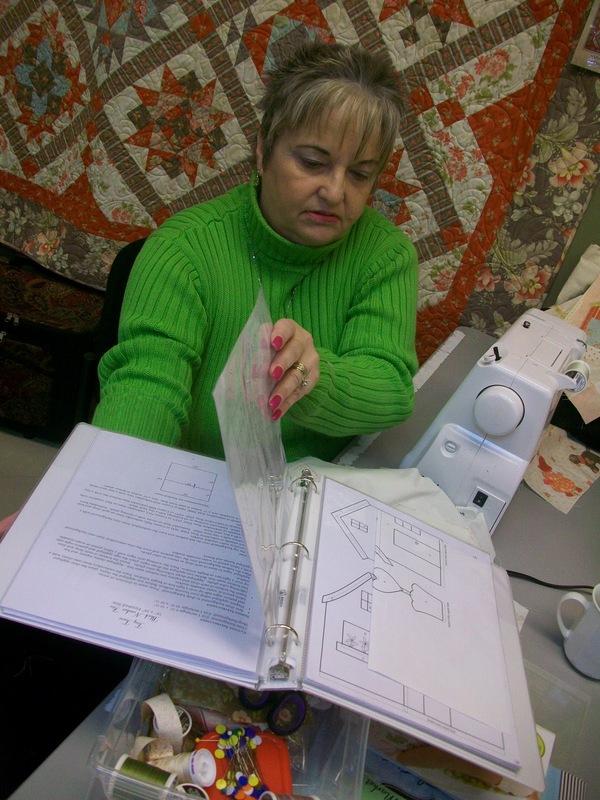 Quilters have the best ideas. 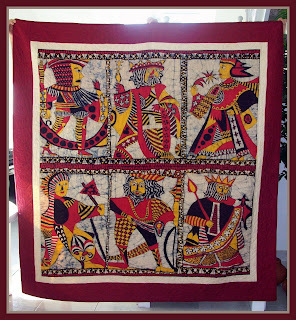 I am always amazed at what they come up with from trial and error and learning from other quilters in their travels. This is Sue from my Tiny Town class and she has a great way to keep herself organized when she does a block of the month. She gets a binder with plastic folders and she puts each month in a different sleeve. She puts the picture, the pattern, instructions and templates all in one sleeve so she never has to go rummaging thru a ton of paper and separate bags for each month's pattern. Another great tip she had was to run over to Staples with her template pattern. For a very reasonable price they reverse the template pattern piece so she doesn't have to waste time drawing the pattern reversed on a lightbox or window...wow what a time saver. Thanks for the tips Sue. I can't believe I've actually got it altogether. All that needs to be done now is for it to be quilted and then all the little buttons and such added to it. The setting squares turned out nice but were a lot of work. It seemed that I was doing the log cabin thing for hours. I'm really pleased with how it turned out and it should be sweet when I long arm it in a snowflake pattern. It was worth all the work over the last year to get it done. Thank you Anne Sutton for offering this fabulous free BOM to your blogging friends. This is Nadine's quilt and it is all boy! The fabrics are beautiful and just vibrant with color. The backing is the fabric with the cars, buses and motorcycles on it. The front fabric has traffic signs and cars on roads, and landscapes. It was gorgeous in the oranges, greens and blues...just too cute. 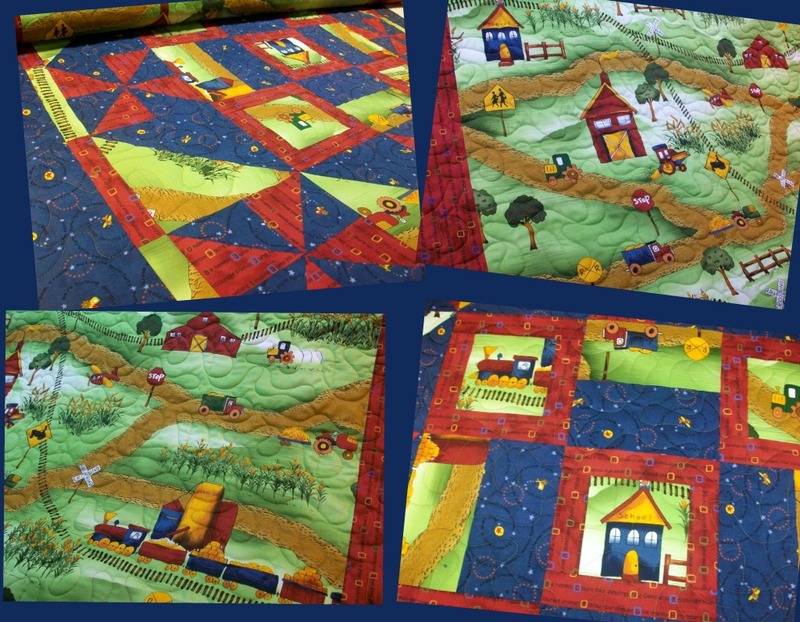 Any little boy would love to have this quilt. Great job Nadine! This is block two from Anne Sutton's (Bunny Hill Designs) free BOM Henrietta Whiskers. Henrietta has a new friend named Sophie. Sophie is supposed to be sitting on a pumpkin with a little sign that reads "free pumpkins", however, in my stash I didn't have any orange so decided I would use green and make it a squash. Same vegetable group, different color. It works. and Sophie doesn't seem to mind. I had a lovely little acorn button in my button stash which worked really well as an add on. I can't wait to see what's up for March! Don't you just love the saying on this little pillow? I've had it for years. 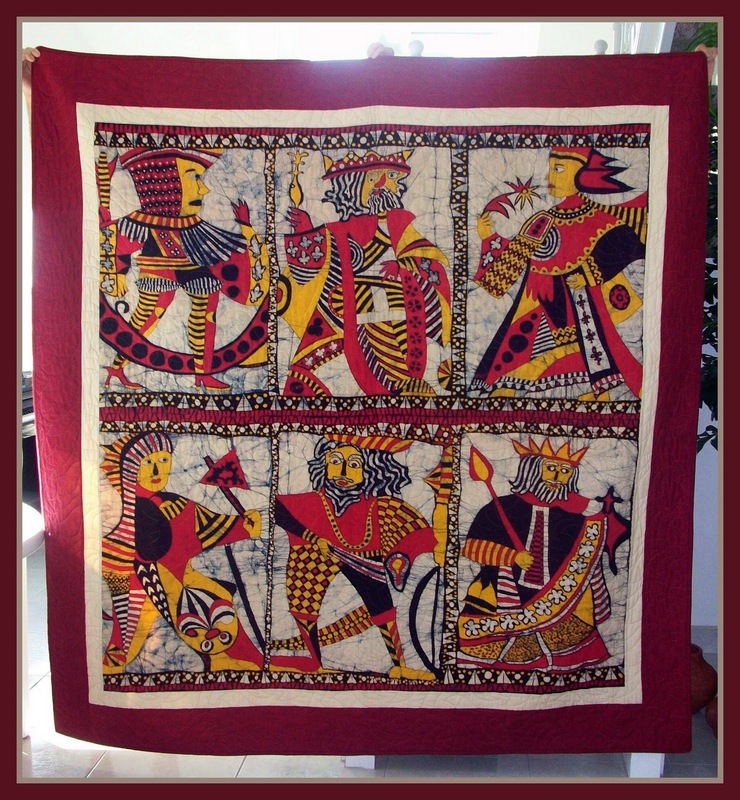 I remember buying it at The Creative Sewing Festival in Toronto quite a few years back, it was just a tapestry rectangle that you could make into what ever you liked. My hubby doesn't think it's funny and keeps throwing it off the bed. He's just grumpy! 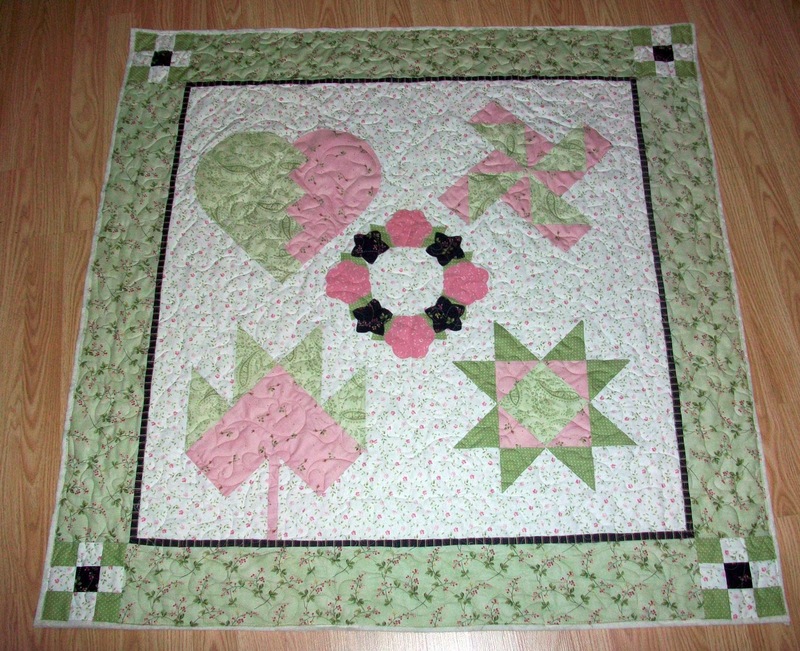 The quilt on our bed is one of my favorite and is called Jelly Bellies from Miss Rosie Quilt Co. The quilt is all made from charm packs of Thimbleberries and I made it at a class quite some time ago at Gone to Pieces Quilt store. It has 238 (yikes) of the little snowballs put together to form the centre and then a railroad tie border all around. So simple but so effective. OMG, we had the best weekend while are hubbies and kids were away. We got together first thing Saturday morning, sewed all day and night ( I brought the meals the first day) then got up the next day and did it all again...what a fabulous weekend...I need to have my hubby go away do that more often. It was great even though it snowed and snowed and snowed. My friend Sue, made 2 jumpers for her granddaughter and she was successful in putting in her very first zipper. I even learned how to make gnocchi from scratch (Sue supplied the meals the second day). What a fab weekend, thanks Sue! My sister brought this fabric down for me to long arm for her. Isn't it cute! It's perfect for a little boy's play mat and I can envision her grandsons lying on it moving little dinky cars on the roads. She chose a bright green flannel for the back and I quilted it in my pattern Gentle Winds which looks like little roads once it's stitched....Too cute! Patches is just hopping by to say hello. This is the fourth doll I have created for Kindred Spirits Quilt Co. and he is so cute in flannels. His body is out of brushed cotton and his clothes are all out of flannel. 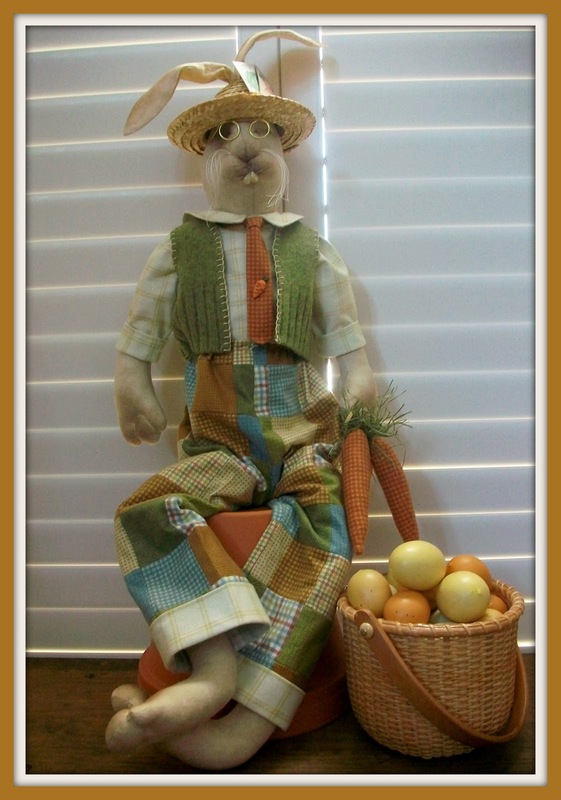 He is right in time for Easter at the store and will be offered as a class in the next few weeks. I love his buck teeth and his little glasses. He looks so dapper in his Sunday best complete with a carrot tie tack. I had so much fun designing him and making him. He is quite simple to make and the face, paws and feet effects are done with simple sculpting of needle and thread. 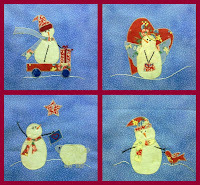 I'm finally finished plowing through each of my "Snowbound" blocks from Anne Sutton's Bunny Hill Designs. It seems appropriate that I would finish them during one of the major snowstorms this year. Seems fitting! These were the last four I had to complete .I love the way they turned out, but now I have to put all the blocks together in a fairly intricate setting design that Bunny Hill Designs provided. Maybe it will be finally complete before all the snow thaws and melts. I have a thing for snowmen so this is a real favorite of mine. 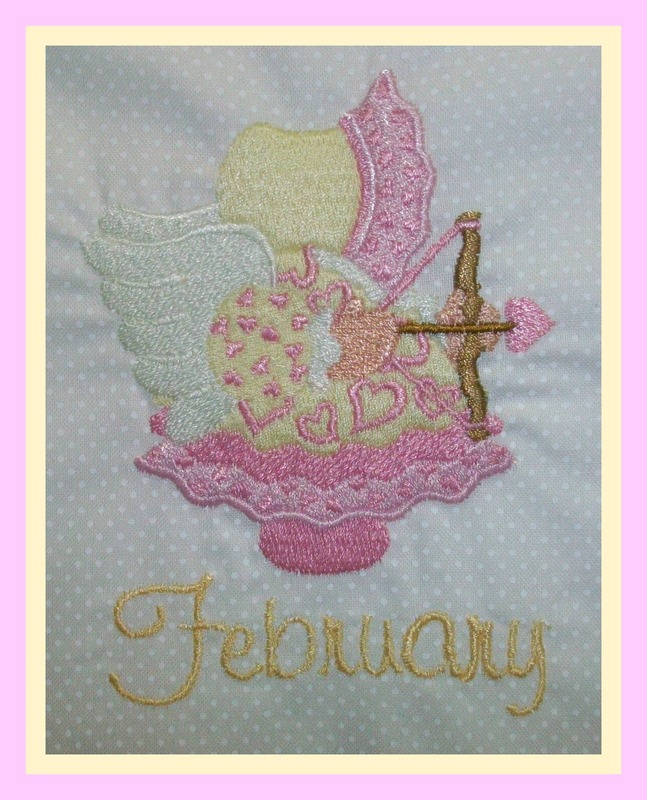 This is Block 2 for February from Little Miss Shabby entitled Birdie Stitches BOM. It is supposed to be all embroidery, however I'm not much of an embroiderer so I opted to applique it. This BOM is adorable, and I love it. The little guys are so cute and I can hardly wait for the next one to come out to see what she has designed to compliment the month. February is perfect with the little birdies obviously so in love! This is one of my favorite quilts and it hangs proudly in the small hall separating our living room from our kitchen. The wall is quite large so the quilt is perfect to fit it and make a statement. I remember getting the quilt kit from Gone to Pieces quilt store and I remember getting it at half price, which makes it even more special. The centre piece was a panel and you attached all the pieced borders around the centre panel. It was one of the first quilts I long armed when I got my machine. I forget what the name of it is, hence, that is why you should always have labels on your quilts when you complete them. It's hung super easy by using a metal electric (hollow) pipe 3/4 inch which slips through 2 eye hooks at each end. All you do is run the pipe through your hanging sleeve at the back and slide the pipe into the hooks...it's invisible at the front and the pipe is quite sturdy so there is no wonk in your quilt at the top. 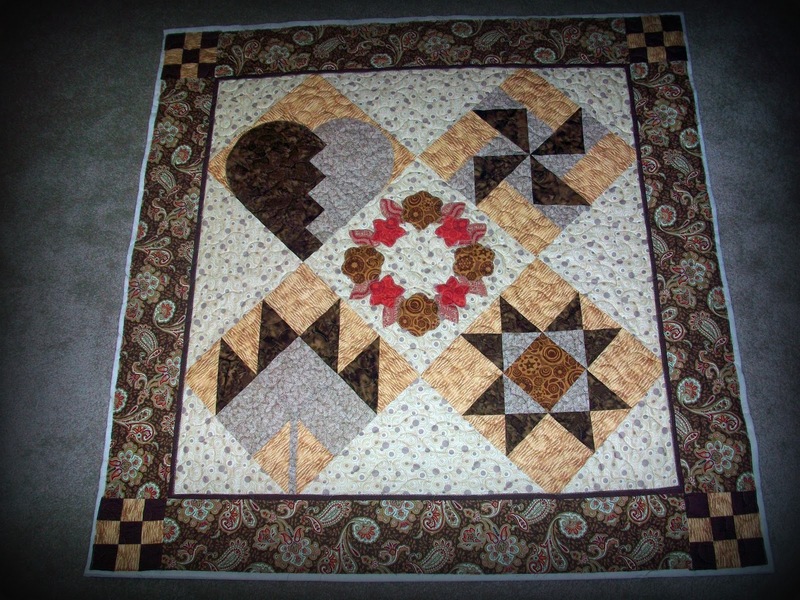 This quilt was completed by the mom of one of my students, Donna. Donna's mom is 84, I believe, and did an amazing job of this abstract/geometric quilt. We opted to quilt it in the pattern Camellia's, which turned out very nice. Donna made two matching pillow shams for her mom to go with the quilt and she says it looks lovely on her bed. I hope I can still quilt that well at 84. Well done! 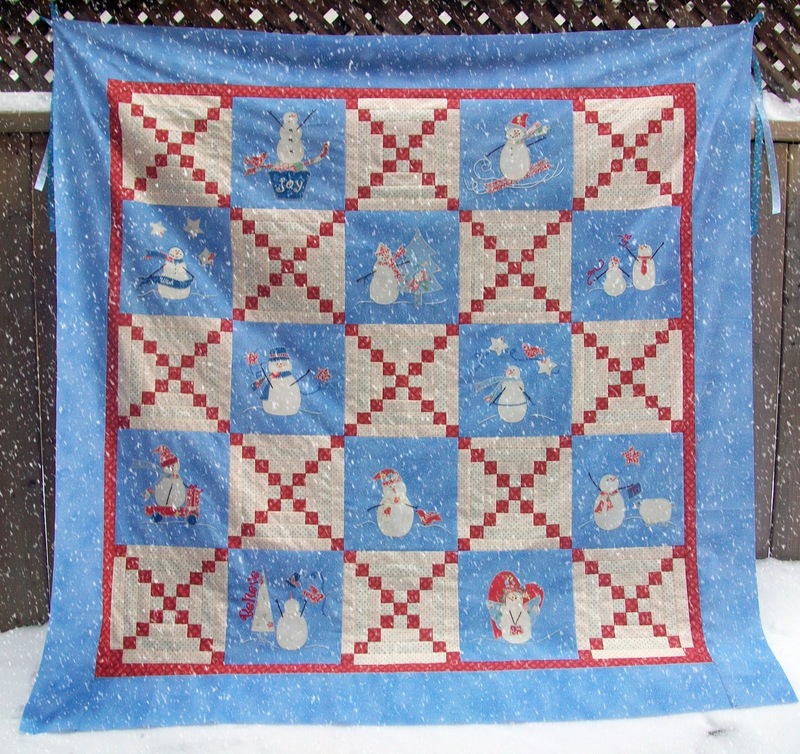 This is Donna's quilt that was long armed before Christmas. 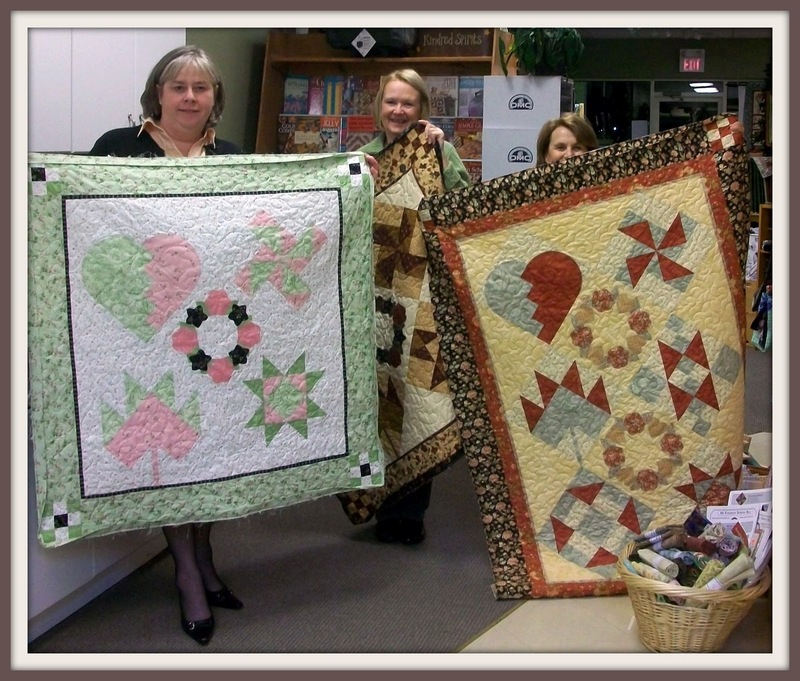 Donna does a beautiful job of all her quilts and they are a pleasure to load onto the machine and complete. This one was chosen by her children for her as a gift and it looks lovely. The deep burgundy and green go so well together. She lucked out with the backing as it's not from the same line, but you would never know. I love the little patchwork blocks between the sashings. While I was in Grand Cayman visiting my Uncle, I was fortunate to be there while he was having some of his art exhibited. 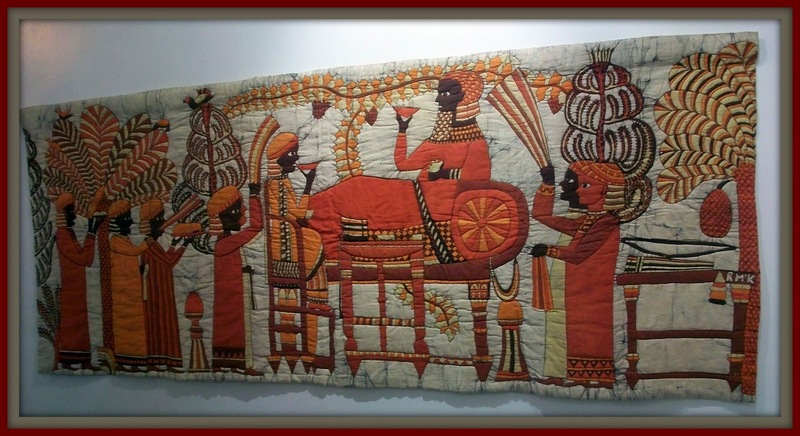 This is a quilt batik that he did which is quite stunning. It resembles the Egyptian hieroglyphics. 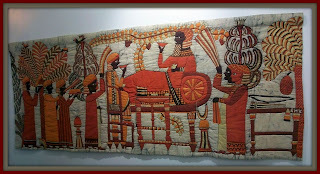 He did the batik cloth first, then quilted it with batting and backing by hand. It is quite unique. He is very talented and at the show he sold five of his framed art batiks. It takes a lot of wonder under, scrap cuttings and time to complete all the blocks for Tiny Town...but it's done. My sewing room looked like a bomb hit it construction zone while I was working on them all, but it feels great to have them all complete. About 5 still need all the blanket stitch completed, but at least they are up on the design wall at the store so that students can peruse them while attending class. It was such fun to see the little town come to life! 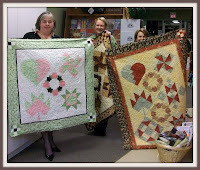 Here are my beginners with their completed and fully quilted beginner projects. From Left to right....Bernadette, Jane, and Kathy( she's pretending to be short Wilson from Home Improvement)...our 4th Musketeer, Liz, opted to go on a Caribbean vacation with her children. She needs to get her priorities in place, can you imagine missing a quilting class in exchange for the sunny south? The ladies did an amazing job and I an so proud of them. I hope they continue their new found passion for quilting. 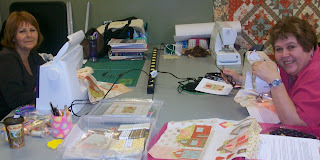 This is Marnie and Elaine from the Tiny Town BOM class held at Kindred Spirits Quilt Co. They are faithful residents the 3rd Saturday of every month and come prepared to construct their little Tiny Town villages. They are both characters and there is tons of laughs and a great deal of fun on those Saturdays. You can see the work in progress on the table and they both mean business when it comes to getting their Tiny Towns complete each month. 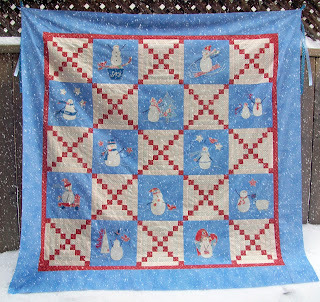 My friend and customer Debbie made this quilt and isn't it adorable. I almost didn't want to give it back after I quilted it. It is so sweet. 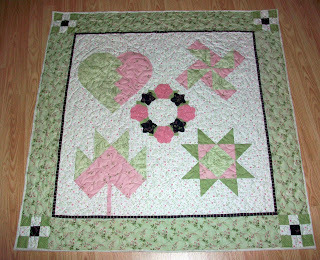 It's all done in flannels and has the sweetest flower appliqued in the corner. Debbie asked me to embroider "Avery"'s name on the quilt as well. 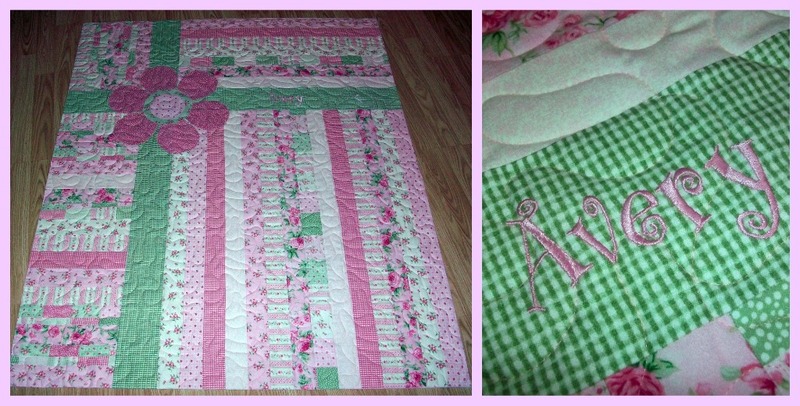 Avery is one lucky little girl and Debbie you did a fabulous job on this quilt. It is sooooo very sweet! At quilting that is....Liz was in my last beginner class and proved her hidden talents in quilting. Her quilt looks amazing even though she really wasn't fond of a couple of her fabric choices. I tried to tell her that it looks amazing for a first quilt, but then after it gets quilted it looks phenominal...and it does! The lonarm quilting just seems to bring a quilt alive. I quilted it in the pattern Happy Times and it suits it perfectly. 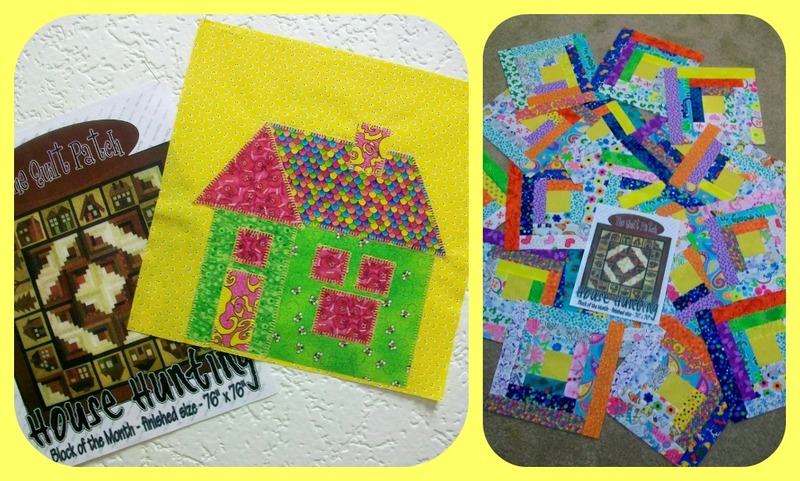 I think she did a wonderful job and I hope she continues to enjoy this wonderful new distraction called quilting. 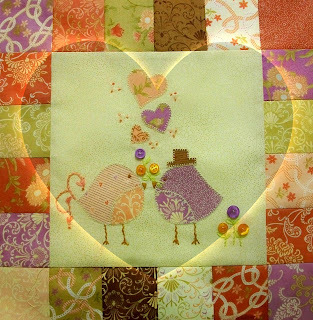 Isn't it great when quilters share their secrets....I love it. 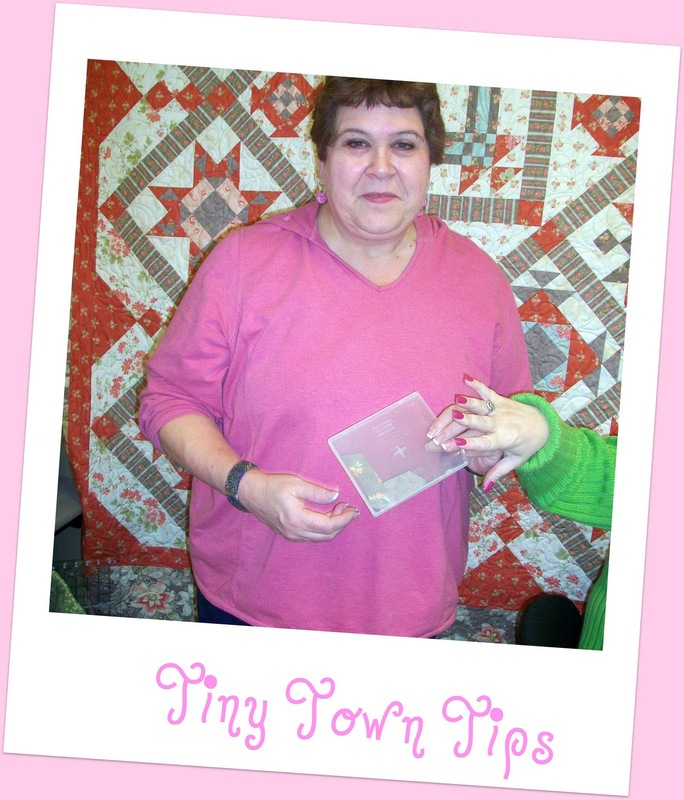 Mary Ann who is the Tiny Town BOM club at Kindred Spirits Quilt Co. Store shared her secret to keeping each block nice and neat. Rather than fold them or stuff them into a container, she rolls the block around a mailing tube and then fastens it around with Velcro tabs. How smart is that. This way, if you just get the applique pieces attached with wonder under, but not sewn, you won't get pieces coming off because of wear and tear in your container or bag. You also won't have to press each section again and again as it is always rolled neatly around the tube, until you are ready to sew all the blocks together. This is my beginner student Jane's quilt. Didn't she do a phenomenal job for a first quilt. Jane was one of four lovely ladies in my last beginner class and for beginners they all did amazing. Jane is obviously hooked on quilting now and has even finished a second quilt as well. She signed up for a jelly roll class and finished it in Christmas fabric. I know this as she just dropped it off to be quilted by me and it looks lovely as well. I'll post pictures once it's completed. It's so exciting when your beginners go on to quilt more, it makes it so rewarding to have taught them their first steps and stitches. "Patches" the Wrabbit is well on his way to making his debut at Kindred Spirits Quilt Co. store. He just needs to pull himself together, get dressed and hop over to the store for the spring doll class. I have been designing dolls for the doll class at the store each quarter for the last year and this is "Patches" the design for the spring class. I thought it would be fun to have an Easter type bunny with the season fast approaching. He's made out of brushed cotton and dressed in wonderful flannels. Well, don't want to give away too much before he is totally finished. I'll share the little guy with you shortly once I he gets his ____ together. I'm always amazed at the remarkable job new beginner quilters do on their first projects. 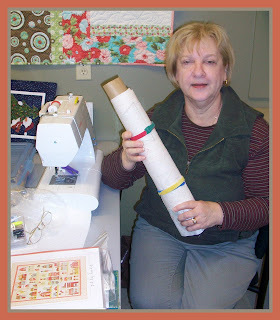 Bernadette's work is no exception and I love her fabric and color choice. It is so fresh looking and will be a lovely addition to any table come spring. I commend Bernadette for her attention to precision, she spent many an evening class carefully picking out what she considered to be less than perfection. When others may have given up, she persevered and even with a horrendous winter cold at one point. It looks lovely and I know that she will enjoy her efforts for years to come. I hope she continues with her new found quilting niche.